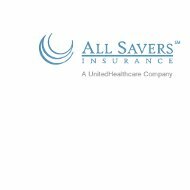 This All Savers Health Insurance Company review will focus on All Savers Insurance Company located in Green Bay, Wisconsin. The company has been in operation since 1986. If you are in need of a health insurance plan, there are various options available to consumers without health benefits through the workplace. Enter your zip code into our free health insurance quote finder to find the best option for your needs! All Savers Insurance Company offers health insurance plans to consumers and businesses in five states. The states the company currently works with are Ohio, Wisconsin, Michigan, Arizona, and Indiana. All Savers Insurance Company uses the UnitedHealthcare Choice Plus network of doctors and hospitals. The company uses the Medco network of pharmacies for prescriptions. The list of doctors and pharmacies that fall under these networks can be found on the All Savers Insurance Company website. All Savers Insurance Company plans may vary based on the state. Deductibles for pharmaceuticals are based on a tiered system. All plans have a $10 co-payment for tier 1 drugs. This includes most generic drugs. Co-payments for other tiers will vary based on the plan. All Savers plans have a medical credit included with all of their health plans. The medical credit covers medical coverage before a deductible is necessary. The insured person only needs to pay for the co-payment. All Savers Insurance Company refers to this as a pre-deductible. The credit will range between $500 and $1500 depending on the plan that is chosen. The pre-deductible resets every year. Businesses that are searching for health care coverage for their employees have several options from which to choose. All Savers Insurance Company makes customizing a plan easy for employers. The employer can pick a class of medical coverage and recommend a plan for its employees. The employees can choose any plan within that class at no extra cost to the employer. Some of the customization options are regarding the deductible versus the co-payment. Employees can decide to have a smaller co-payment in return for having a larger deductible or vice-versa. There are many other options similar to this for employees to change the plan the employer has chosen. All Savers Insurance Company offers its members access to the UnitedHealthcare Choice Plus network of doctors and the Medco network of pharmacies. The All Savers website has links to help you find what doctors and pharmacies are included in their networks. A toll free customer service support line for members is (800) 232-5432. The customer service line for broker assistance is (866) 405-7174. The website has PDF files that outline the structures of the plans offered by All Savers Insurance Company. These files are broken up by state. The plans that are offered do vary based upon the state in which you live. For more information, you can access the website or call the customer service line. There is not an option to access or change your health plan on the company’s website. Having this coverage through your employer will generally give you access through a login portal setup by your company. All Savers Insurance Company is not rated through AM Best. They are also not listed on the Better Business Bureau website. There is a lack of online reviews for this health insurance company. The company has been in operation since 1986. While this is not as long as many of their competitors, the insurance company has been running for more than 20 years. There is no reason to doubt the legitimacy of All Savers Insurance Company as a health insurance provider. The lack of reviews does not indicate anything negative regarding this company. If you are looking for an insurance provider, All Savers seems to be a viable option to consider. If you live in one of the five states they are able to serve then you can look deeper into the options that are available through All Savers Insurance Company. The number of people you will be including on your policy and any health conditions those people have will be important when you are deciding what plan will work best for your family. There are always ways to cut down the premium by cutting down the coverage. Speak with a representative for further assistance in determining the best plan for you. Use the free quote finder to find the best health insurance quote for your specific situation by entering your zip code!